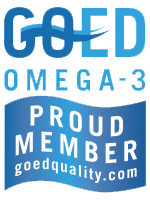 Founded in 2006, GOED is a not-for-profit trade association with a goal to increase consumption of omega-3s to adequate levels globally and to ensure that the industry is producing quality omega-3 products which consumers can trust. It is an association of the finest manufacturers, marketers and supporters of EPA and DHA omega-3, working to educate consumers and collaborating with government groups, the healthcare community and the industry. GOED sets high ethical and quality standards for our business sector, demanding particular levels of purity and freshness and guidelines for heavy metals and other contaminants of fish oils for its members.